It's Friday afternoon after a long day and a long week. You board your train and are lucky to find a seat, soon it is crowded with people standing and chatting. You feel tired after the day, and think just about taking a late afternoon nap upon coming home. But you plug your earphones , turn up the volume just until you can't hear the train sounds and you are in another place. Together with Bill Evans and his trio in Paris, you delight at his glimmering notes, like fireworks in a pitch dark night. You follow the rhythms of Eddie Gomez (the bassist) and Marty Morell (the drummer) for the journey while Bill's piano keeps on gleaming in the night. 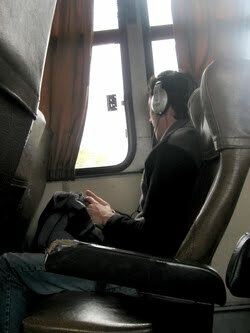 Your body is inside a noisy train, but your mind is just anywhere else, just you and your music. You can hear the soft mumbles of Glenn Gould while he plays the Goldberg Variations, or the fans reach the heavens at the end of Knockin' on Heaven's Door by Guns N' Roses. You stand in the middle of the Sydney Orchestra while KISS' Paul Stanley tells you he knows a thing or two about her. Music can take us to other places, and drive our mood just through the roof or straight down to the basement. We just need to tune in into the song and we will be there, choose wisely. Be it upbeat or downbeat, if you commit to really listening, be prepared to the change in your mood. I started very recently to take guitar lessons and learned a very important thing. Although I don't realise it the day I skip my practise, the day I practise I feel very different after doing my chords and arpeggios. I can spend very easily an hour without being aware of the time, practising first, playing freely a little, or trying to make up the notes of some melody that caught my attention recently. Of course, this can only get better with time, as the mechanics of playing get ingrained in my muscles and my hands just creates the sounds my mind thinks of. Think about listening carefully as a form of meditation, probably best suited for today's work life, when the only free time we may have is our commute, between work and preparing supper. Our mind, just like our legs after a 10km run needs a cool down after a work day. If you fail to give it, you'll feel the mental equivalent of sore legs: mental fatigue. Take a deep breath, plug your earphones and disconnect. Take also advantage of the effect music has on your mood. Just like 'music tames the wild beast', it can change how you feel: for the good or for the bad. Choose wisely, depending on what you intend to do. When you are feeling down or tired, get yourself some moody music, close your eyes and let it flow through you. Let the sounds make you soar and start feeling good again. And when you are feeling terrific, put also some more upbeat music: you will get conditioned to feel terrific with it. And when you feel like it, listen anything: music is meant to be played and heard. If you liked the subject of this post, you may enjoy Effortless Mastery: Liberating the master musician within, by Kenny Werner. If you liked this post, please share it with your friends through HackerNews, Reddit, Twitter or whatever sharing method you like. Thanks!